After the success and critical acclaim of Ridge Racer, it was only natural for Namco to want to build on the series. 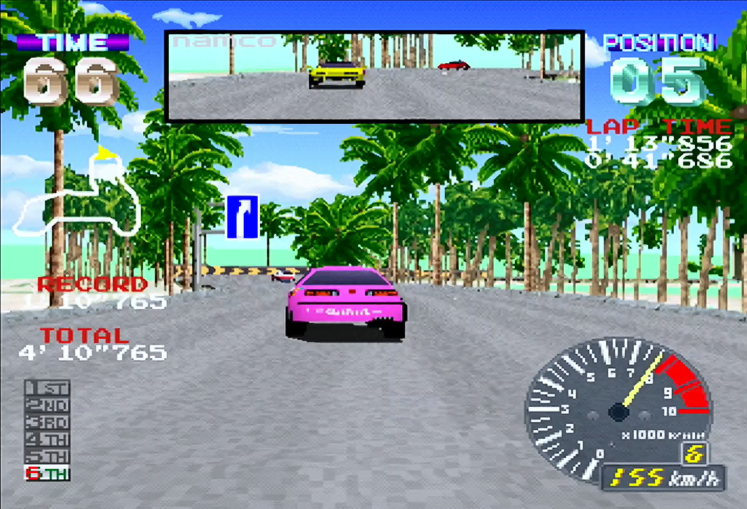 It went about this in a number of ways, including a three-screen arcade release for a more immersive experience as well as a spectacular “Full Scale” variant in which you sat in an actual car (a Mazda Eunos Roadster, to be specific, in a pleasing callback to Ridge Racer prototype Sim Drive’s predecessor) to play a version of the game on a massive projection screen with real car controls, functional instruments and fans blowing wind in your face — a setup which Ridge Racer 7 would pay homage to in one of its title screen CG sequences many years later. A sequel was inevitable. Ridge Racer 2 followed its predecessor a year later, featuring new tracks, new music and the facility for up to eight people to play simultaneously by networking four two-player cabinets. This was then followed in 1995 by a home port in the form of Ridge Racer Revolution for PlayStation. 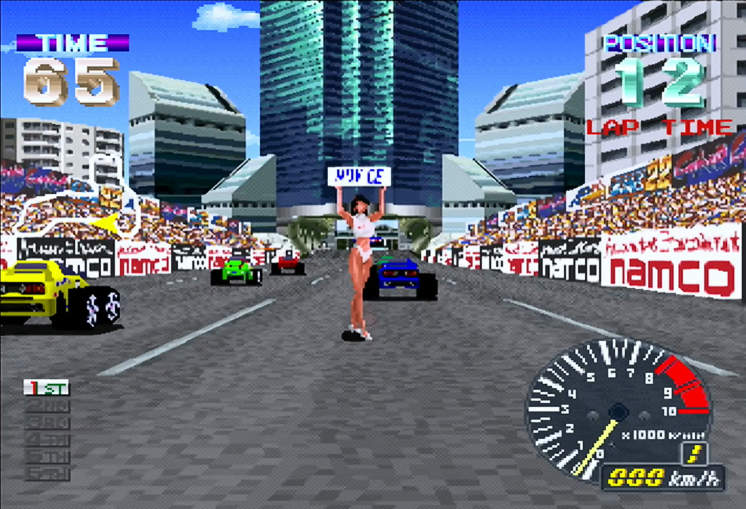 Neither Ridge Racer 2 nor Ridge Racer Revolution were a significant deviation from the basic Ridge Racer formula, instead adopting an approach Namco had taken many years previously with its Pole Position and Final Lap titles. 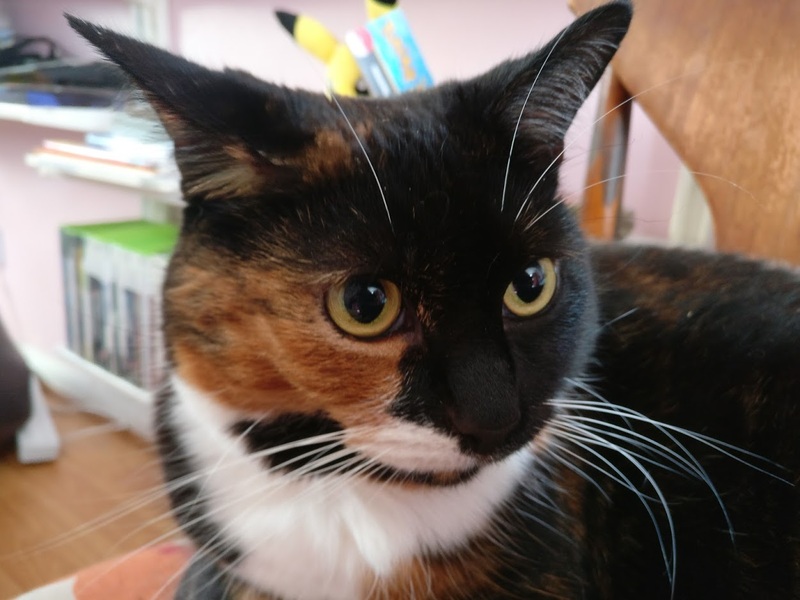 In each of these cases, “sequels” tended to be more like expanded versions than completely new games, and Ridge Racer 2 and Revolution were no exception — although, as the differing names suggest, there were some differences in approach. Specifically, Ridge Racer Revolution was an attempt to make the home port of the game more than a simple conversion of the arcade game. While development of the original Ridge Racer for PlayStation ultimately proved to be anything but straightforward, its final incarnation was still little more than a direct conversion of the arcade machine, with little in the way of depth or long-term appeal. This was, as we’ve already discussed, entirely by design, but the team working on Revolution still wanted to add a bit more longevity to the home release. Ultimately their results in this regard were somewhat mixed and these grand plans would not reach real fruition until the much later Ridge Racer Type-4, but at least the intentions were there. Ridge Racer Revolution’s main additions to the formula set by its predecessor included a system link two-player mode — not quite the eight-player battles of Ridge Racer 2’s arcade incarnation, but an improvement on the strictly single-player original for sure. The team made the decision early on to eschew a more conventional split-screen multiplayer mode in favour of the multi-system, multi-screen setup primarily due to the fact that the Ridge Racer games were already believed to be pushing the PlayStation hardware pretty hard, and the degraded performance and visual detail necessary to get it running acceptably in split-screen were a compromise that director Kazumi Mizuno was ultimately not willing to make. 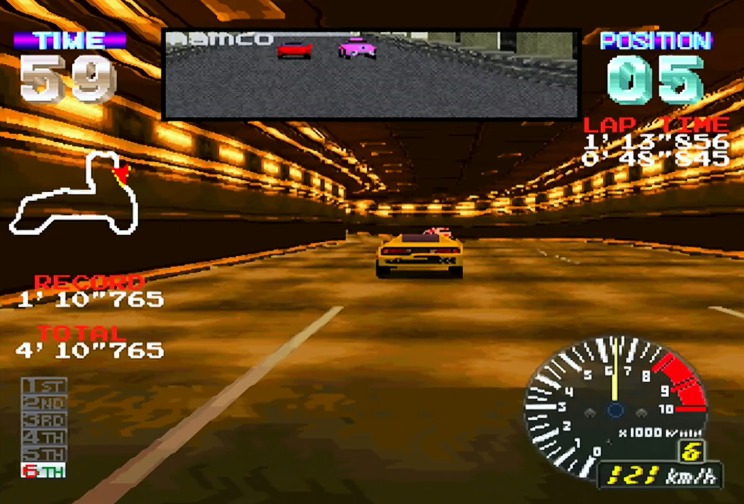 As well as the new multiplayer mode, Ridge Racer Revolution added a Free Run mode in which players could practice the available courses as much as they wanted without interference from other opponents, and could even select the speed grade of the cars they would be practicing in; much like the original, higher difficulties of race were accompanied by faster cars, requiring quicker reactions to drift around corners and avoid obstacles. Besides this, two hidden unlockable modes were added. 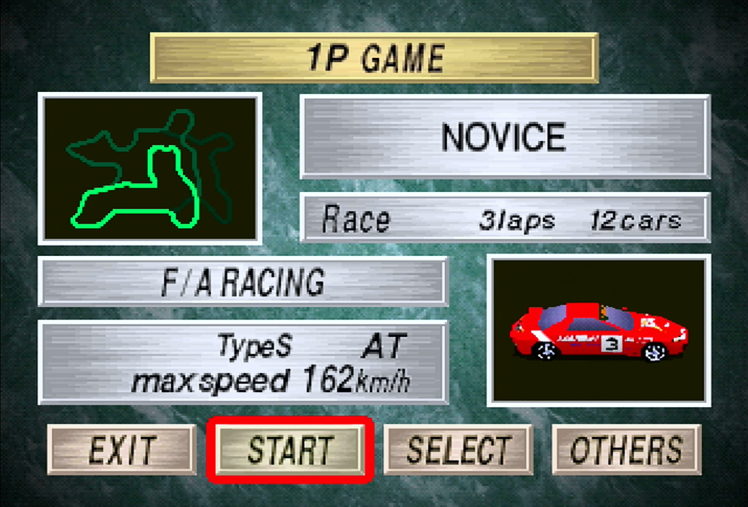 A drifting competition — predating any of Bizarre Creations’ style-centric racers by a whole console generation — could be unlocked by choosing the Time Trial race and pressing the gas and brake buttons simultaneously when selecting the Start button, for one. And a super-deformed mode making use of Choro-Q-style buggies was available if you defeated the loading screen minigame — Galaga ’88 this time around, rather than Galaxian — using the “homing laser” cheat. (Hold down L1, R1, Select and Down, then press Triangle to fire.) 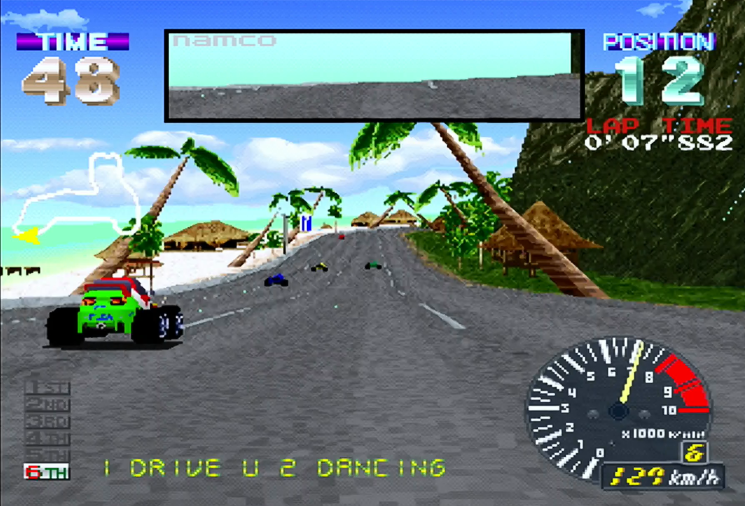 This latter mode proved so popular that it ended up getting its own standalone arcade release in the form of Pocket Racer, running on Namco’s older System 11 hardware. The underlying game had been adjusted and improved, too. Opponent cars now had somewhat improved artificial intelligence, with this being most apparent in the challenging rival and boss cars you’d take on in the Time Trial modes. Handling had been tweaked a bit, too, giving the whole thing an overall rather more aggressive feel to it based on Ridge Racer 2’s similar refinements for the arcade version — though the changes to drifting take a bit of getting used to if you’re accustomed to the handling of the original! Ridge Racer Revolution was met with a largely positive reception on its original release, with the refinements to the basic formula and additional features going down well — though common criticisms included the absence of a split-screen multiplayer mode (regardless of the reasons for its omission) and the fact that, overall, it didn’t feel like a significant advance over the previous game. Indeed, a reviewer for UK magazine Next Generation accused the game of being a glorified expansion pack, even going so far as to say that anyone paying full price for it was “a half-step away from being conned”. It’s true that from a modern perspective, Ridge Racer Revolution is particularly lacking in content compared to more recent racers, even with all the bonus features and unlockables. Most of what it offers over the original is the sort of thing we’d see in a downloadable content pack or two rather than a separate full-price sequel with a retail release, but since DLC wasn’t a thing in the PS1 era thanks to the system’s lack of online connectivity and expansion packs were only really seen on home computers with the facility to install data to a hard drive, this is what we got. This isn’t to say that Ridge Racer Revolution is a bad game, mind you. 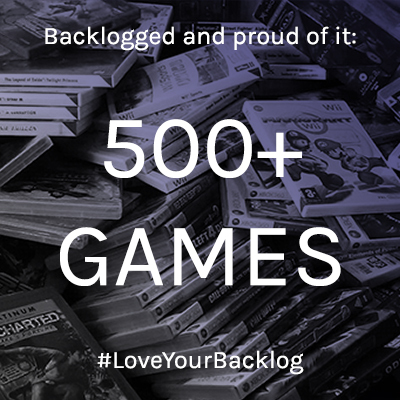 It maintains the delightful immediacy of the original game — arguably making it a bit more challenging thanks to the more aggressive handling — while offering a marginally greater variety of different ways to have fun with the additional modes and multiplayer option. 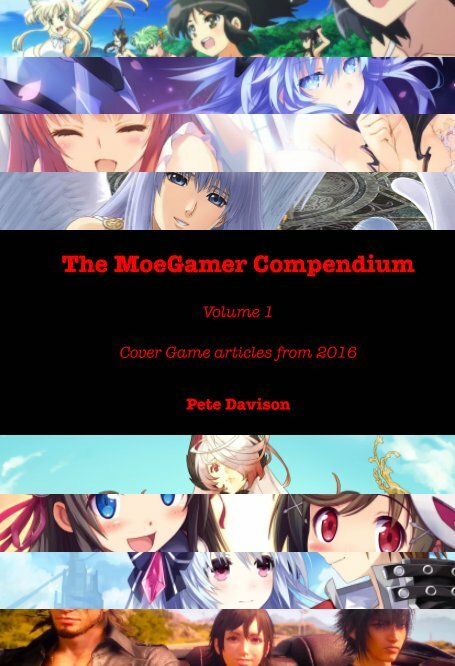 And with the fact that both it and its predecessor are some of the most common PS1 titles around, the question of “value” that came up around its original launch is no longer an issue, since you can pick up both Ridge Racer and Revolution for less than a tenth of the price of a new release at the time of writing! Both Ridge Racer and Revolution may be showing their age a bit now, but they’re still fun arcade racers that are enjoyable to play, even with their flaws. It’s from here onwards that the series started to get really interesting, though, so that’s where we’ll be picking up from next time.